James I of Cyprus (or Jacques I de Lusignan) (1334 – September 9, 1398) was Regent of Cyprus for his infant nephew Peter from 1369. When Peter died in 1382, James became King of Cyprus that year. James was also titular King of Armenia and titular King of Jerusalem 1382–1398. James was the third son of Hugh IV of Cyprus and Alix of Ibelin, and became king upon the death of his nephew Peter II. Before becoming a king, he had other offices and was known for his resistance against the Genoese invasion against Cyprus. After the death of his father Hugh IV, James' half-brother Guy, titular Prince of Galilee was already dead and his eldest brother Peter I, who reigned for 10 years, was then murdered. The latter's son, Peter II, who was a minor, began his reign when he came of age. Meanwhile, Peter I's wife Eleanor of Aragon to revenge her husband's death, invited the Genoese to invade Cyprus. Since the Genoese had commercial and financial interests in Cyprus, they invaded the island in April 1373. After achieving the takeover of the well-fortified city of Famagusta, they arrested and held captive Peter II and his mother Eleanor who had invited them. After they killed the nobles who had murdered Peter I, they wanted to take control of the island. After the end of the war, Eleanor succeeded the murder of John, which she claimed she was responsible for her husband's murder. James married his kinswoman Helvis of Brunswick-Grubenhagen (1353 – January 15/25, 1421) (daughter of Philip of Brunswick, Constable of Jerusalem and Helisia of Dampierre) in 1365. 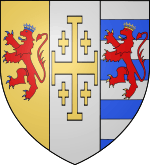 Her brother John of Brunswick-Grubenhagen (d. June 11, 1414 unmarried and without issue) was an Admiral of Cyprus and their father Philip of Brunswick-Grubenhagen (ca. 1332 – August 4, 1369/1370) was a Constable of the Kingdom of Jerusalem. James was created Constable of Cyprus, and in that office, led the war against the Genoese in 1372. During the invasion, the other two sons of Guy, James and John, resisted the invasion. James fought well in Kyrenia, resisting the Genoese attack, a resistance that was victorious at the end, under the command of James. However, his nephew Peter II, signed a Treaty with Genoese, who kept Famagusta and in the Treaty, James had to leave from Cyprus. James, stopped the war and left the island with a ship from Kyrenia in 1374 and went to Europe. At first he went to Rhodes, where he found no help and he was arrested by Genoese and went in Genoa as a captive with his wife. With the capture of Kyrenia in 1374, he was taken as a hostage to Genoa, where he consummated his marriage with Helvis, whom he had wed when she was twelve. Most or all of their children were born in Genoa. Due to his captivity, he was not crowned until 1385. In Genoa he lived with his wife under hard circumstances for 9 years, and she gave birth to their first son Janus in that city. After Peter II's death in 1382, since Peter had no surviving issue, the Parliament of Cyprus decided James to be the king, while he was captive in Genoa. Genoese, in order to release him to go to Cyprus to become a king, they negotiated with him and received his signature for agreement on February 2, 1383. Under that agreement, Genoese had new privileges for commercial activities. Famagusta was still under Genoese sovereignty, something that was never accepted by either James and other kings after him and during his reign he tried to regain that city. Until he was released, the Kingdom of Cyprus was governed by 12 nobles. After he was released in 1383, he was not accepted, as it is referred by the historian Leontios Makhairas and returned to Genoa. Some nobles opposed the return of James, led by the brothers Perotte and Vilmonde de Montolivve, who were believing that with that situation they could become kings. James' opponents could not be beaten, until 1385. In April 1385, James came back again in Cyprus and he went to Nicosia, where he was welcomed with great enthousiasm. He was crowned in May 1385 in Saint Sophia Cathedral by Paul Palaiologos Tagaris. After his crowning, his opponents were arrested and punished. He was crowned King of Jerusalem in 1389 and in 1393, Leo VI of Armenia died, and James assumed the title of King of Armenia, and was formally given the title in 1396. That kingdom was by now reduced to the city of Korikos, which had been in Cypriote hands since its conquest by Peter I of Cyprus. So when in 1382, Peter II died, James succeeded him, since Peter didn't have a son. He died in Nicosia. Upon his death, his son Janus succeeded to the throne.